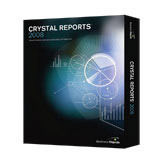 Editions: Crystal Reports 2008 comes in a single edition that is the feature equivalent of the previous Developer Edition. Crystal Reports 2008 Visual Advantage is a soft bundle of Crystal Reports 2008 and Xcelsius Engage 2008. Data sources: Native, ODBC, OLE DB, and JDBC connectivity to relational, OLAP, web services, XML, legacy, and enterprise data sources, and new salesforce.com driver.